If you are planning to holiday in the UK then why not stay in luxury while you explore the many fantastic attractions of the Snowdonia National Park. 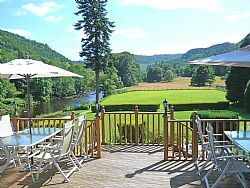 For a limited period only we are offering 7 nights in a Standard double or twin room with dinner, bed & breakfast for the amazing price of £645 per person or for just £125.00 more you can upgrade to a Riverview superking or twin, both a huge saving off our standard tariff. This offer is only for bookings in 2019 and excludes all bank holiday periods.